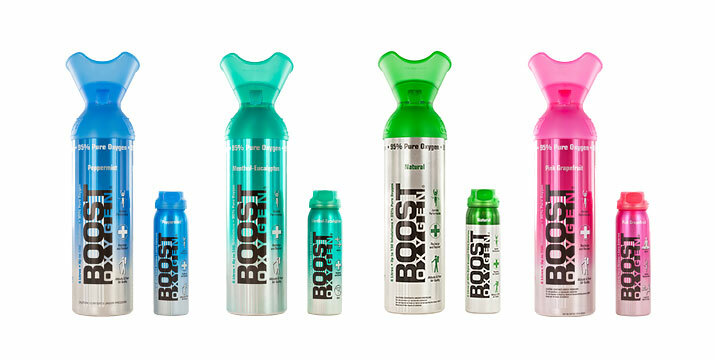 Boost Oxygen is the perfect way to energise and optimise your workouts at the gym. Medical studies, past and present, have shown that inhaling oxygen before and during physical activities enhances endurance, performance and cuts down on recovery times. Breathing Boost Oxygen will help you overcome lethargy and achieve your peak performance. During its time of need, the body’s response to maintain blood oxygen levels is to breathe more heavily to increase oxygen intake. When the body does not receive enough oxygen from the outside, it starts to source it internally. This is called Anaerobic Respiration. Muscle fatigue and cramping occur when glycogen in oxygen-starved blood turns into lactic acid. Adding oxygen to the blood inhibits the production of lactic acid, and helps the body clear out any lactic acid that is already present. For fast recovery and enhanced performance, try Boost Oxygen Peppermint. For strenuous sports, use by taking three-to-five inhalations before an event, three-to-five during a rest period, and three-to-five at the end to speed recovery and stay on top of your game.